I'm really excited to be part of VegFestUK in London this month! VegFest host the biggest events in Europe. I was hoping to get to the UK in person, but will only be able to speak via Skype (from Melbourne where I'll be for World Vegan Day) - and aim to be in the UK and EU mid-2017. I'm excited that there's not only going to be a Vegan Athletes Summit on the Saturday, but also a Pro-Intersectionality Conference on the Sunday. There's really just SO MUCH happening here! 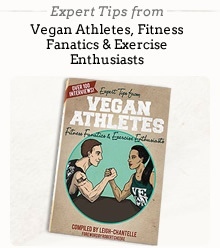 Purchase my Vegan Athletes Book! Alex from Vegetarian Guides will be selling my book at his table and Robert Cheeke will also be selling them at his Vegan Bodybuilding table. There will be a chance to get all of the above athletes in my book to sign your own book, so please see the Vegetarian Guides table. See ALL of the other Vegan Events taking place this year.